Year after year I am finding that Enterprise Architecture certifications are becoming more important to architects. Back in 2007, I remember reading an article from Gene Leganza called, “Is EA Certification Important?”. In that article he stated that 65% of the people he had surveyed stated that EA certification is not important but he also noted that a significant minority stated they were including EA certification criteria in their hiring processes. Over the years, I have seen that minority rise significantly. First it started with software vendors and consultancies that required certifications for EA’s. Now we see certification requirements in job descriptions and RFP’s for vendors. The reason for this is very simple, trust. Companies want to make sure that architects have been validated by an independent body so they don’t have to go through that same rigorous process and focus on their business challenges. The next year I found evidence that there was a shift as well. In a post, “Enterprises are Embracing Architecture Certifications” I discovered an article from IT Job Watch that stated that salaries went up by 21 percent with certifications. Surprisingly in the UK geography 80% companies require TOGAF certification. While this is just one data point, you also see this on job descriptions on popular job boards. However, when you look at the landscape of certifications it can be very confusing and even daunting to try to figure out which ones to take. Certifications take a substantial amount of time to study for, prepare and to actually take. This coupled with the impacts of todays economic climate of reduced IT budgets and education it so much more important to pick the right certifications. To help reduce this confusion, I created the Enterprise Architecture Certification Reference Guide. Within it, I distill the EA certification domain within a framework that splits each certification into a logical areas. The Enterprise Architect Certification Reference Guide serves as an atlas to navigate the specific certifications for a Enterprise Architecture (EA). Other areas of architecture such as domain or solution architecture are within the corresponding Certification Reference Guides. The reference guide decomposes certifications into a framework that allows the EA to identify the certifications that are right for them. Starting with certifications that validate an EA’s competencies (experience and skills), then to certifications that derive from a specific business or industry set of concerns to the foundational certifications that enhance the skills of EA’s and will aid in the acquisition of competencies. 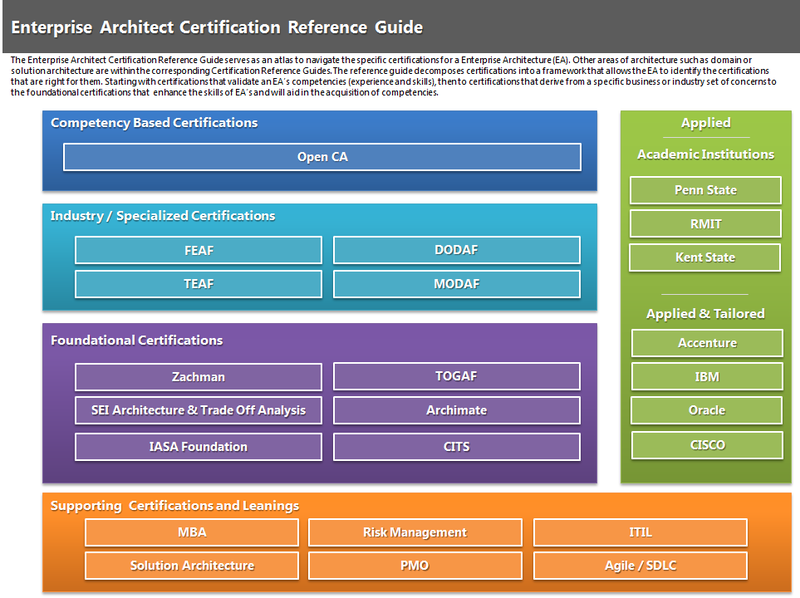 As shown above, the Enterprise Architect Certification Guide provides a framework to how to think about EA certifications. Competency Based Certifications – These certifications are focused at evaluating your experience to validate that you are indeed an architect. Much like many other certifications in the industry (e.g., PMP). These are much different to others that determine what you know instead of how you applied the knowledge. Industry / Specialized Certifications – Driven from a predetermined set of concerns such as the federal government or a specific industry is where these derive from. While these certifications are critical in that vertical, often times they do not transfer well across verticals given the difference in drivers and motivations of these very specific bodies of knowledge. Foundational Certifications – Provides the essential skills for EA’s. These certifications are different from the other two in the respect that they validate that you’re an architect while foundational certifications validate that you know a specific methods, models and/or tools. These certifications are essential to EA’s as they populate the EA’s toolbox. For example, without an overall enterprise architecture framework how would we be truly effective as EA’s? Applied – Divided into two primary areas, Academic and Vendor Tailored they either support a certification or provide a certification highly tailored. These are in a supporting function to Competency Based Certifications. Supporting Certifications and Learning’s – These certifications make a well rounded enterprise architect. These are often referred to or leveraged in the day in the life of an EA.